While the rest of the world is gaga over the Flow hive, die-hard comb honey fanatics like me still wonder why anyone would do that to honey. Like rum without Coke, macaroni without cheese, or fish without chips, honey without the comb is unthinkable. Some couples are just meant to be. Well, you get the idea. Not good. 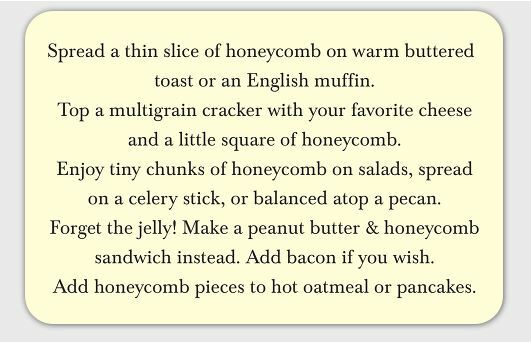 For many years I wanted to include a little set of instructions with my comb honey, but I couldn’t decide on a format. Postcard? Brochure? Flyer? It all seemed like too much paperwork for one small chunk of honey. 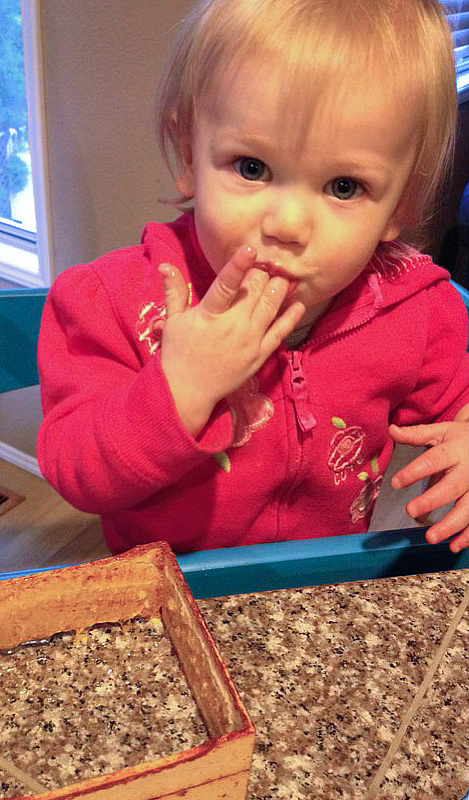 After all, food that comes with footnotes, schematics, and part numbers can be off-putting. Then one day Gretchen, a beekeeper in my area, told me about a label she designed to fit on the lid of a mason jar. I cottoned to the idea of a tiny label, so I asked her to send me the text. Turns out, I was really impressed with her wording, short and to the point, but when I asked if I could use it on my own label, she sheepishly admitted, “I stole it from you.” Oh dear. That lapse of memory worried me so much I put the project on hold. A couple of years passed before I finally decided to start over. I consolidated the instructions onto a business card, front and back, and then had them printed on heavy, glossy cardstock with rounded corners. They came out great. You can stick them on with tape, slide them into the container, punch a hole through and tie them to a jar with ribbon or raffia, or include them with your business card. The information is there without being the main event. So far, they are working out well. Front of the comb honey card. © Rusty Burlew. 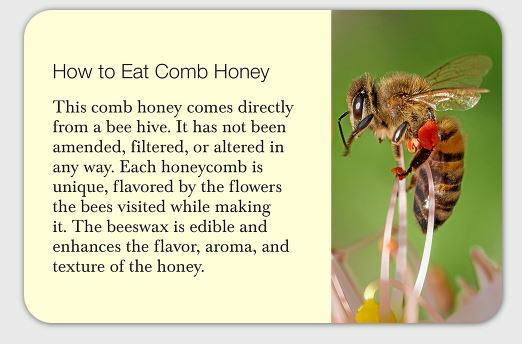 Back of the comb honey card. © Rusty Burlew. Then again, some folks don’t need instructions at all (I’m related to this one). Child © Anneke Davis. Please note: The cards have been sold out and are no longer available. Rusty….I’d like 100! I hope you get enough subscribers. Great! You are first on my list. Love the idea, just not ready to use the cards yet! I too would like to have 100. I would love 100 of these. Most of my customers love honeycomb. I’d take 100. Vistaprint does a good job and has competitive prices. While I get the honeycomb component, some of us aren’t prepared to haul honey supers from where our apiary is located to the house…much less the process involved to remove the honey. I love the idea that guests can visit and walk down with me, fill a jar, see the bees and have a mini-experience of how the basics of nature and our girls are hard at work. I am incredibly inexperienced and rather overwhelmed with farm chores, so the flow hive seemed like a good thing (especially as we get older and the chores get harder to do). Guess I’m not a die hard…. Rusty, I LOVE this! And the fact that I was planning on switching to comb honey this year instead of extracting is even better! I’d love to get some…put me down for 100 as well. I am interested, but what am I looking at cost wise for 100-150 do you think? 100 for me as well, please. I would love about 200 as well. Please! I’d take 50, prefer 3 X 5 card or smaller. Rusty this is just what I’ve been looking for! I’m in for 200.:) Sweet! They are beautiful. I’ll take 100 also. Put me down for 100 too. I suppose it wouldn’t cost too much to send a 100 of them to Canada. I’d be down for at least 100, if the price is right. 100 for me please Rusty! Try Vista Print. For 100. you can get over 2000! I’m in for 100. If you need help, let me know. Great idea. I am also appalled by that Flow hive. What a great idea! My ignorant friends will become informed honey comb consumers. I definitely will take 100 of these beautiful labels. I am just sorry that I never thought of this myself. Rusty, if you or readers would like versions in French, Spanish and Arabic, let me know. Sorry, can’t do Dutch. Credit card does not go through? I didn’t have any problems with credit cards; you are the only one who’s mentioned it. Put me down for 100 also. My cards arrived this week and I am so pleased with them. Thanks for making them available to us. I used to have it posted, but I took it down for various reasons. I can e-mail you a copy. Can you email me a copy please? I lost my harvest and didn’t need them at that time. I’m coming back though, now. Thank you. If you have time e-mail this I would love a copy! This is our first summer with cut comb and it’s so tasty! Thank you for your cutting tutorials as well-dental floss is fantastic. I put the photos of the cards back into this post. Rusty, are you still doing this? I’d order 50. Sorry. After I sold out, I never reordered. They are very popular with purchasers, though. They seem to help sales because it gives people who have never had comb honey some ideas about what to do with it. I’ve been able to get about twelve good comb honey squares this year and had an idea to generate a QR code and include a link to this page for people to access for a little guidance on how to enjoy honey in it’s purest form. I can insert the QR code onto my label. Do you mind if I reference your site? Thanks for all of your wisdom and advice. Sure, give it a try. Sounds cool! Let me know if you do another order or if I can get the template and have them done myself. Thanks. Okay, Glenn. I asked the company that printed the cards if I could leave the template available for other people to order, but they don’t have a system for doing that. Since people like you keep asking, I may just go ahead and order another batch. Will let you know. Wow. I have eaten (chewed like gum) for years. Started maybe 50 years ago. I never knew the comb was actually edible. I’ll have to try something new soon.